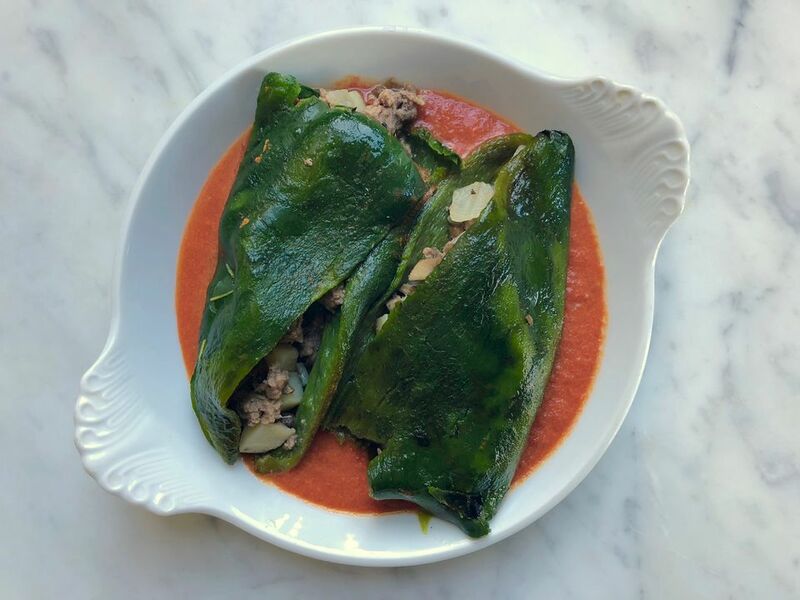 These chiles rellenos are roasted, stuffed, and baked (and even the roasting part of optional!). They are topped with spicy tomato sauce to marry the flavors of whatever you decide to stuff them with—see the many options below. The first step of roasting the chiles is completely optional. Some people find the thick chile skin difficult to digest and roasting makes it possible to peel that skin off. Preheat an oven to 400 F. If you like, roast the chiles to blister (and remove) skin. You can do this by charring them over a gas burner, turning them with tongs as necessary, or by placing the chiles on a baking sheet and placing under a very hot broiler until blistered on one side, turning, and blistering on the other side. Once charred, either wrap chiles in foil or place in a large bowl and cover and let sit and steam for about 15 minutes. The skins of the chiles should now slip off easily. Whether you've roasted the chiles or not, cut a slit in each chile starting at the stem end and going about half-way down the chile. Remove as many seeds as you can from each chile and set them aside. Heat a frying pan over high heat. Add the oil, onion, and garlic. Cook, stirring, until fragrant. For meat fillings: Add the ground meat, if using, and cook, stirring, until meat is cooked through and browning (you may need to remove excess fat from the pan to get good browning). Use a spoon to remove fat from ​the pan or drain the meat on paper towels. Return the meat to the pan, add salt to taste and lime juice. For cheese filling: transfer the cooked onions and garlic to a large bowl, let them cool off slightly, and then toss them with the cheese. Stuff the chiles with meat or cheese. Lay in a very lightly oiled baking pan and bake until the chiles are soft and the filling is hot, about 20 minutes for roasted chiles and 30 to 40 minutes for unroasted chiles. Meanwhile, prepare the creamy spicy tomato sauce. Remove the chiles and top them with the sauce (or put the chiles on plates first and then top with sauce). Serve with extra sauce at the table for people to add as they like.